It’s a beach where the wildlife don’t see many humans, at least until we start coming out and taking hikes in the spring. For that reason, Iverson Spit and Livingston Bay are one of our favorite beaches. Nature is usually not happy to see us. It squawks, it growls, it flies, wriggles, or gently slips invisibly away. Her creatures quickly concede territory, hold tight, then return after we move on. 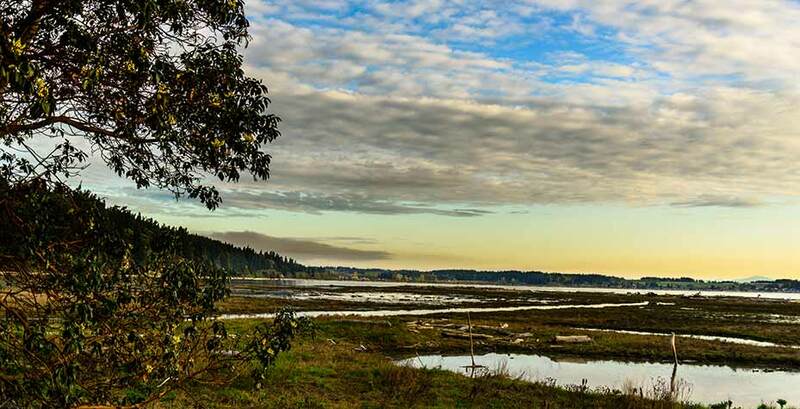 Livingston Bay and Iverson Spit sit side-by-side on Camano Island’s eastern shore and together, serve as a shore and wetlands wildlife preserve. I came to watch the day begin. It was dark, with no real hint of sun. Yet, just steps from the parking lot the place was already alive with birds. We all knew first light was soon. I had the Internet. They had instinct. From Stanwood take State Route 532 west. In about 3.6 miles, bear left at Terry’s Corner and continue on 532 for another 2.9 miles. Turn left at Russell Rd. Drive 1.05 miles and turn right at Sunrise Blvd. Drive .25 miles and turn left on E. Iverson Beach Road. Follow it .4 miles until it becomes Iverson Rd. Drive .75 miles until Iverson Rd. ends at a small parking lot. The parking lot is at the end of a long row of seaside homes. Where these personal refuges ended, nature’s refuge began. There’s a small gravel parking lot, big enough for only a handful of cars. Early morning at Livingston Bay, a haven for wildlife. The sun snuck into the sky that day; shades of black brightened into a hundred kinds of gray and only a tease of color crept out around the edges of the clouds. The driftwood echoed the gray; solid objects with the aura of ghosts. I’m not sure if it was the ducks, or maybe it was the heron. But, long before I saw them, and far sooner that I expected, these birds were squawking, flapping, and otherwise putting great distance between themselves and me. Maybe because it was spring, or maybe that’s just how things were here, but these birds clearly weren’t used to seeing humans anywhere near them. At Iverson Spit there’s a slightly elevated viewing platform easily located just a few feet from the parking lot. This is part of the state bird watching trail system, and the platform makes for easy access for bird watchers and photographers. There are only a couple of stairs up to get onto the platform, making for easy access. There’s a wide beach, strewn with the driftwood that both protects the beach from erosion, and befuddle people picking their way. After a time on the beach, I took an elevated trail. It was on top of a dike and the height helped with the view. Well-maintained and level, I thought this could be a walk nearly anyone could easily take and thoroughly enjoy. I saw orioles, various water birds, and a hummingbird or two. Some 42 species of waterfowl have been spotted here. The trail continued through a grove of trees before I reached Livingston Bay. A wide circle of trees partially framed the water. 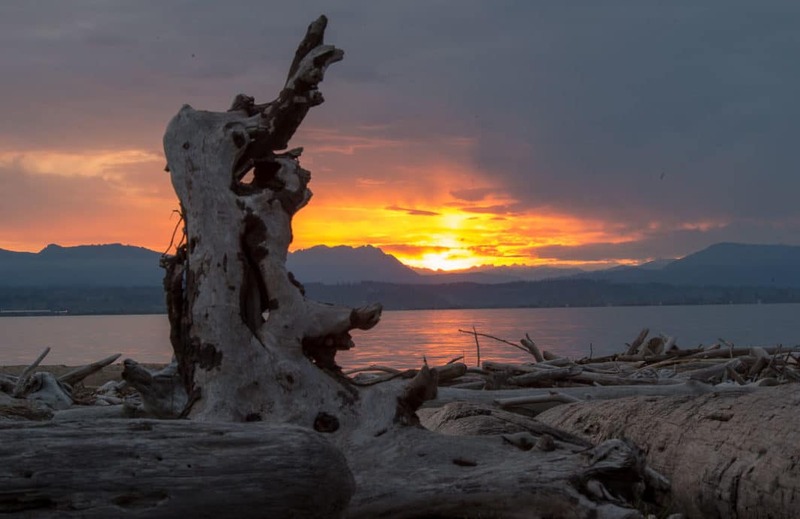 The bay is one of the areas now under the protection of the Whidbey-Camano Land Trust. Throughout Iverson Spit, there were paths that criss-crossed over wetlands, level and forgiving. Some parts of the trail have been upgraded to keep walking shoes as dry as possible, but hiking shoes are really a good idea here. A group called the Friends of Iverson Spit helps maintain the trails. 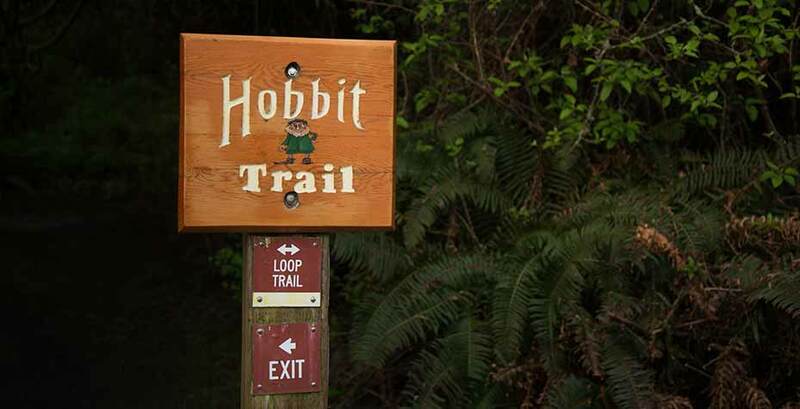 One path, called the Hobbit Trail, meandered through a thicket of trees. The only challenge here was to not trip over tree roots that were in the trail. On the Hobbit Trail you had to duck a little to avoid some branches and be willing to take on faith that when the Hobbit Trail ended, you’d be someplace you recognized. Fortunately, that’s exactly what happened. I heard an occasional frog, and would sometimes hear something splash into the water, but I couldn’t tell what. I was going to see very little that day, and I conceded to myself that I had to be good with that. Nature had better things to do than entertain the likes of me. Early morning was now mid-morning. The nearby homes were alive with people now starting their day. At this time of year, the human workday was much shorter than the wildlife’s day. The long days of summer would add warm leisurely hours when more and more people would walk these paths. Maybe, I thought, the wildlife might get a little more accustomed to having people around. But, I doubted it, and I decided that was a good thing.